How to transfer drawing to the canvas. Transfer Drawing to the canvas! An easy method using simple materials for an accurate drawing. Home > Drawing Pencil Sketches > Transfer Drawing to your canvas. As part of our series on using the Flemish method, to transfer drawing to canvas is our next step. I'm going to give you the method I've used for years to transfer my subject to the canvas. There are many methods to do this, and I'll discuss the majority most artists use today right here. Just remember, these are shortcuts in "drawing." If you really want to learn to draw freehand, start your journey here at Drawing Pencil Sketches. This is my launch page for several exercises and discussions concerning this most valuable skill. It also points you to several other drawing related pages, but for now, we're putting our picture onto our canvas. Remember, painting is simply drawing with a brush. Master the skill of drawing, your paintings, and speed in which you complete a painting, will improve! I'll get straight to the shortcuts, cause if you're like me, you want the good stuff now! If you want more detailed information, I have another recommendation at the bottom of the page, but to get started right now, here's what I use and you won't have to learn how to draw free hand right away! Transfer drawing using the grid method. Let's get a piece of glass from one of your 8" x 10" frames you have laying around. Or a piece of plexiglass, which won't break so easily when you drop this. 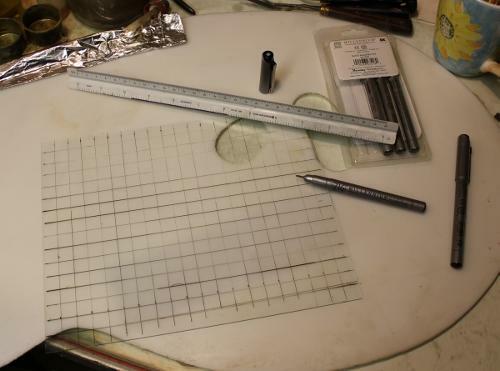 Get out your permanent marker fine tip pens, a ruler, and start marking off 1/2" grids! 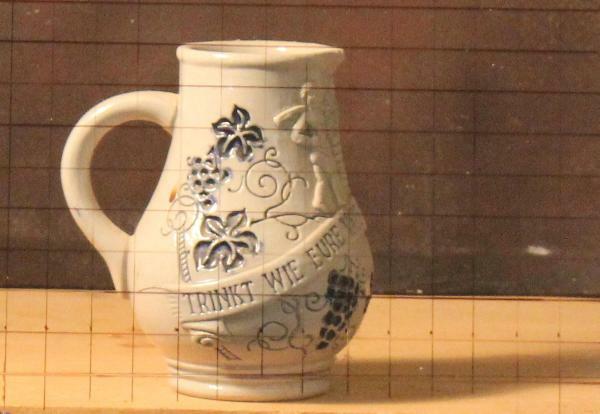 View your still life, floral, or any subject matter through the glass grid, and begin drawing! 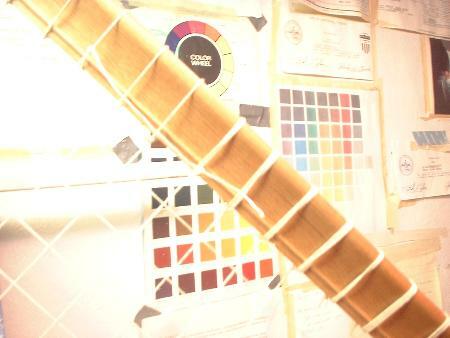 Of coarse, you must also lay out a similar grid onto your canvas. This should be done in pencil! To keep true to size, use the same graph measurements. To double the size of your picture, double the grid size (in this case, use a 1" grid pattern, each square will be 1" on your canvas). The math isn't hard to figure when changing the size of your reference grid to your finished painting. You just want to keep the <b>ratio</b> the same. A simple internet search for grid method will lend you several great sites that show you how. The image shows an approximate 5" x 7" subject matter. 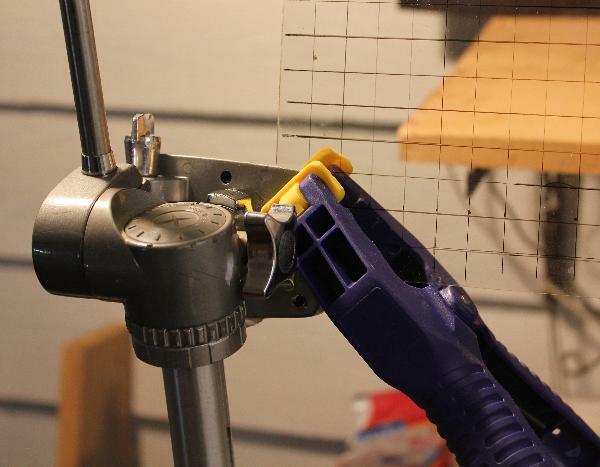 Below, an example of how I've clamped this glass grid to my camera tripod. Be Careful Clamping Glass, yes, I did break the corner off while photographing this piece. 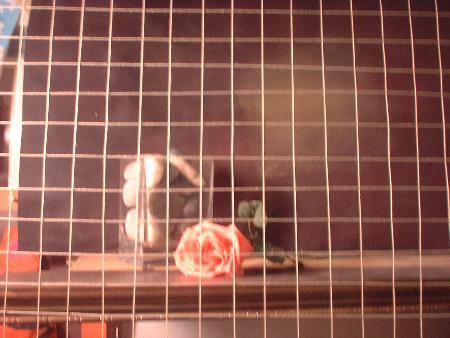 Use Plexiglass! It's simple safer! Now your task is pretty easy at this point. Simply transfer what you see in the particular grid onto the corresponding grid on your canvas. You can number the grids so that you don't get lost, especially if this is a large transfer that you are doing. As you can see in the illustration, you just need to capture the intersecting lines on the grid as you draw. This is shown by the arrows. Shadows can be lightly put in. Continue to draw until the image is done, erase some of your grid lines, and then proceed to the next step of the process. This next step is simply redrawing what you have done in pencil using a waterproof India ink. I talk about this in great detail here: retracing in ink! 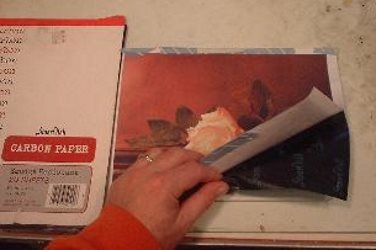 How to transfer drawing using transfer paper or carbon paper method. On small paintings, a simple inkjet printout can transfer drawing onto the canvas just as well. Take a digital camera, photo the subject, print out on your printer, and transfer drawing onto the canvas using carbon paper! Just remember to set these up for life-sized or just a tad larger than real life! If you don't the object will simply look strange. But then again, on some works, you may just want that effect! A miniature or a blown up image depending on the circumstance in what you are painting! 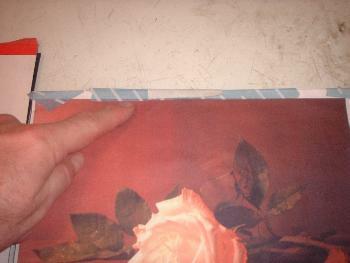 Here you can see a little tape at the top of the print out holding it secure so it will not shift. It's really hard to get it exactly back into place if it moves with you while tracing! When pressing on the original image, just use a ball point pen. This will let you know what you've already traced, and allows you to press hard enough to transfer the carbon. Transfer Drawing using the projector for tracing your photo onto the canvas. 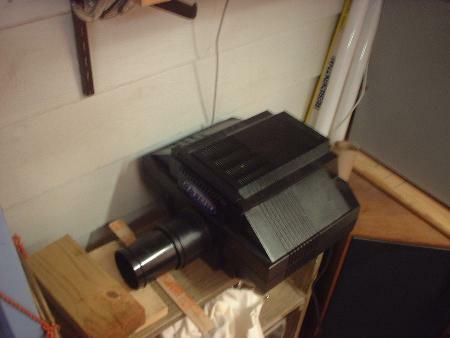 For larger paintings, I use a good quality photo projector. Shocked! Don't be, even Leonardo Da Vinci used an invention he created called a camera obscura, the great-great grand-daddy of modern camera’s to speed up his process of painting. Did he ever learn to draw? Of course he did, but he also used every available tool needed to make his craft better. You can use the cheaper quality projectors, but you won’t be happy with the results because they can’t give you the details you need on larger pieces. A minimum of 500 watts is recommended. Click here to get this great tool! 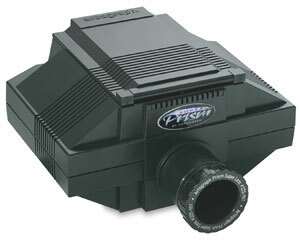 With its finer color and enlargement capabilities, the Super Prism is the choice of many fine artists, muralists, and airbrush artists. It includes both the Prism (see above) and Super Prism lenses. The Super Prism lens is a superior quality, three-element color-corrected lens, ideal for photographs that require fine detail reproduction. It has better accuracy than the Prism lens, and a horizontal projection range of 3X to 20X. 230 mm, f/4.5 lens. Weighs 9 lbs (4 kg). Click here to buy and get more information on this wonderful tool! The super prism. The info page opens in a new window so you will not loose your place here. I've got one, and I use it. Transfer drawing using the super cheap way! "Hey, I aien't got the money for a projector! I don't have a piece of glass or plexiglass. And I don't have any carbon paper!" This transfer drawing is becoming a big pain! This item still hangs in my studio and is quite the nice tool! (Look at some of my video's, and you'll see it hanging up on the back wall! Take an old frame, something that you pick up at a yard sale for $3, and a ball of string. Mark along each edge 1 or 2 inch intervals. 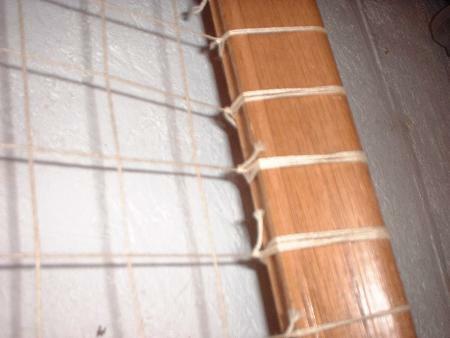 Tie your string at these intervals along one side, then down the other. When you start the cross pattern, interweave the string to help keep them in place. As you can see, it's nothing fancy. Hang it in front of your still life setup or printer picture. 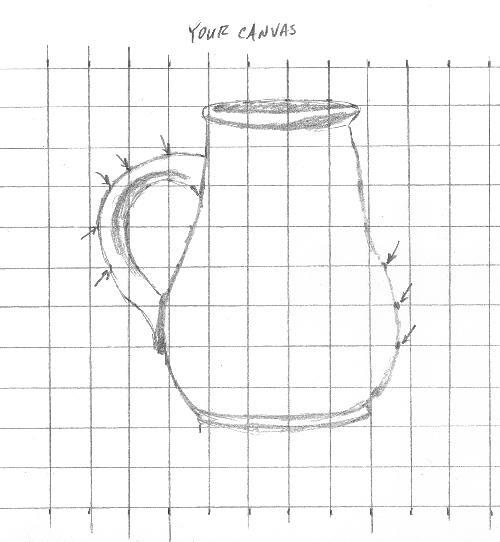 Graph your canvas off at the same intervals as your screen, and begin drawing using the screen grids as a reference. It's much easier to learn to draw or match what you see in a 1 inch square than the entire picture. Concentrate on getting intersecting lines of the 1 inch square correct, and like a jigsaw puzzle, the whole piece will come together. 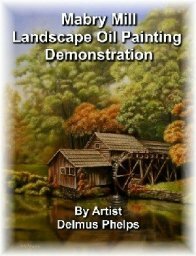 Yes, you will learn to draw using this technique. As your eye to hand co-ordination becomes better, you find you can use other reference than just a string grid to get a good handle on what you are drawing. So, what next? You've prepped your canvas, the transfer drawing is done, you've re-traced the pencil drawing in ink, now your ready to tone the canvas. You can tone the canvas before doing the drawing. It is up to you. I prefer drawing first because I like to do a fairly detailed drawing, and a toned canvas sometimes hides the faint pencil lines that I end up with.